You can take away a pizza but you can’t take away the quality and value of Les Jacobins. Followers of my spare tyre restaurant experiences will realise the width of my taste and indeed the widening effect of my selfless research into the ecstasy of eating. I am prepared to sacrifice my own perfect form to bring you the fullest insights possible. When not savouring foie gras and monkfish I cavort among the fried breakfasts and the fish and chips. Today I turn my attention to pizza. The French love it. The English love it. It seems that everyone in the world has some kind of pizza format. The Italian pizza seems to have found its familiar form when tomatoes arrived in Europe in the 16th Century thanks to the Spanish colonisation of the Americas.This means that the Roman Empire rose and fell without ketchup. It also means that “Bloody Mary” queen of England 1553 – 1558 could never have added juice to her vodka. (She also would not have had any vodka because no potatoes had arrived from the Americas). Writing/researching a blog makes up for my complete lack of historical education. If I go out for a pizza I’m looking for a big hit. I want flavour and savour. Like everyone I have used the pizza chain main street places. I’ve always found them clean and adequate but never special. Recently I went to the French town of Saint-Jean d’Angely to dine with friends. This was not my first time at Les Jacobins. At my last visit the place was at least fifty percent full of English diners. The menu has a large choice of beautifully cooked pizzas, the normal range of Italian dishes, salads and a very generous steak and fries option. There is a decent choice of wine by bottle, pichet, carafe or glass. There are desserts and everything you could ask for to make a wonderful convivial evening. I had the 30cm Clermentoise pizza and Oscar downed the Charentaise. The cost of each unit was about £8 – $13. The entire meal with wine, desserts and coffee was about £50 -$79 for three persons! However, we did not eat there just for the price. The service is great and friendly. The ambiance is welcoming with a real independently run family feel. It sure ain’t any kinda chain joint. There is an outdoor terrace for warm summer evenings. If you are holidaying in the Charente-Maritime region and fancy a take-out meal this is the place to come. The staff speak English if needed. Les Jacobins is situated in the heart of the Saint-Jean d’Angely, close to the ninth century Royal Abbey. The town centre has a medieval authenticity and is worth a visit in itself. So – Les Jacobins receive an Emma’s five star Spare Tyre Tummy Award for value and excellence. Great job guys. Emma Thinx: You are born a pizza base. Get the toppings you want. 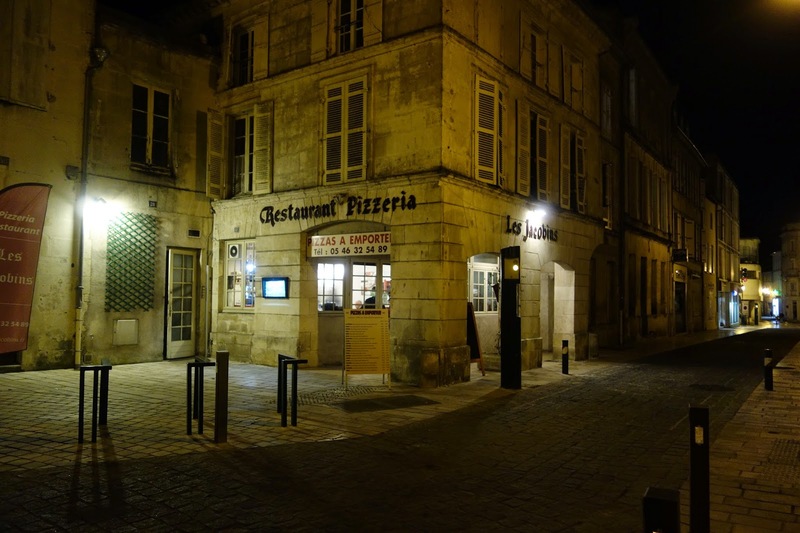 This entry was posted in Charente-Maritime, Emma's spare tyre tummy award, history of tomatroes, Les Jacobins, pizza, Saint Jean d'Angely by emmacalin. Bookmark the permalink.